Yesterday I had a handful of questions about Blaugust that I thought I should address this morning, just in case anyone else had it. Firstly it is absolutely okay to write content ahead of time and stage it to release over the course of the month. With both Pax Prime and Gamescom happening during the month of August, this is more than likely going to cut into some writers schedules. I know last year there were several folks doing great… and then they went to Gamescom and dropped off the face of the planet. Being able to cover schedule irregularities is a necessary coping skill to deal with keeping a schedule. While I personally prefer not to schedule posts ahead of time, quite literally everyone else does this. So for the purpose of Blaugust this still absolutely counts towards your thirty one posts. Another question that I had is whether or not it is cool to tell a story in thirty one parts. This is also absolutely fine, and like I said yesterday this is a challenge about longevity and regularity… not necessarily what you are writing about. A prime example of this is during my NaNoWriMo run in 2013… I knew that I could not do it and blog at the same time. So instead I just posted my nightly words each day as my blog post. So over the course of the month I essentially broadcast the draft of my story to the world. In the case of the person who asked me yesterday, they wanted to write the back story of their primary game character over the course of the month. That seems completely valid, and at the same time something that would be extremely awesome. The constraints of this contest are about producing thirty one posts during the month, and so long as those posts mean the constraints of the challenge you are doing just fine. I have a good friend Rylacus who is going to be starting Final Fantasy XIV soon. Over the year plus I have been contiguously playing this game I have talked to him about the patching schedule. I mentioned that about once a quarter we get a big patch, and usually more than once a month we get little minor patches. The problem being that he had no real frame of reference as to what I meant by those two things. Yesterday 3.0.5 was released and this is absolutely what I would call a “small patch” by FFXIV standards. When I linked him the patch notes he was completely floored by the fact that we call that a minor patch. A lot of things happened yesterday, not the least of which is the introduction of the Esoterics tier of Tomestones. I keep thinking at some point they are going to run out of goofy names to call these, but they seem to have a limitless fount of them. This allows players to purchase item level 200 items, and returns us to the state of the weekly tomestone cap of 450. The weapons once again are priced just enough to force players to hit that cap three weeks in a row to get them. 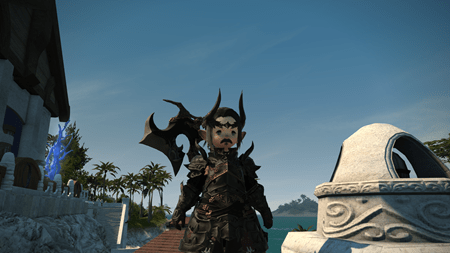 Yesterday was also another significant moment for me and my Warrior as I finished upgrading all of my gear to level 180 (other than the Alexander ring that I should be getting tonight… ). This means I am essentially “done” gearing with Law and can now start diverting that to my Dragoon who is roughly halfway to level 58. I was reaching this point where running dungeons was not nearly as important for me as it had been in the past, and then bam… a small patch releases and once again I am infused with this desire to hit the dungeons every single day. This time around Expert Roulette is going to be my key focus, and we have learned in the past that through running a single roulette every day for several days in a row.. you can cap your tomestones without doing anything terribly insane. What I marvel at however is the timing of their content. Quite literally just as we started slowing down our dungeon running fervor… they launched yet another tier of gear giving us even more reason to get excited about running dungeons again. This game is absolutely phenomenal at figuring out the right mix of carrot and stick. Another huge thing yesterday is that Savage Alexander opened and now the bleeding edge of Final Fantasy XIV raiders can throw themselves against that content. As of this morning it seems like only a handful of free companies have defeated the first turn, and only one or two have managed to defeat the second. So it seems like it will take folks a good deal of time to actually conquer this raid. For our guild however, we are still very much in the gearing process and have yet to be able to field a reliable “normal” Alexander run on a regular basis. 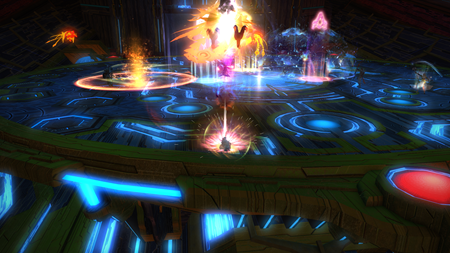 What our Monday night group has been working on instead is finishing out the Final Coil of Bahamut. I realize we are quite literally “months behind” as the saying goes, but I am still very much enjoying myself. We managed to take down Turn 12 on Monday night and made what I feel is significant progress on Turn 13. Ultimately it will probably take us a few more weeks, which is good… because we still only have one geared tank for the Monday raid. As a result… I ended up solo tanking turn 13… which is quite possibly the most hectic thing I have done in a long time. My world became entirely centered around making sure I had five stacks of wrath at the right moment… so I could hit Inner Beast plus another cooldown… in order to survive the tankbuster… which of note means that it literally does enough damage to decimate my 25,000 hit points. The worst timing however was on the pull when quite literally I was hitting my fifth ability and gaining my fifth stack of wrath… as the attack was casting that I needed Inner Beast for. Needless to say that night stressed me the hell out… but hopefully we can down him soon. I would love if the axe dropped, because it is super amazing looking. What I really hope however is that we can finish gearing and start work on Bismarck Extreme, Ravana Extreme and Alexander for gear. Wait, you beat T12?! Go you! And T12 and T13 probably have my absolute favorite cutscenes. Especially the end of T12. I hope you watched them because they are definitely some of the best in the game. I finally tried frontlines for the tomestones and it was actually pretty fun. This patch definitely gave me a reason to do my roulettes again though. I don’t think I’ll be diving into Savage until it’s probably farmable since I don’t really have a static nor do I really have a set time that I can keep up with one. So for me my goal is to just get a full set of Esoterics gear because um yeah I love the SMN and BLM sets lol. But now since they won’t be able to share gear I actually need to make a decision on what to main. Alas, the Murf Method of writing it all the month ahead is totally legitimized here. Sadly, I didn’t do that this time! Yay, you got Ry to play!